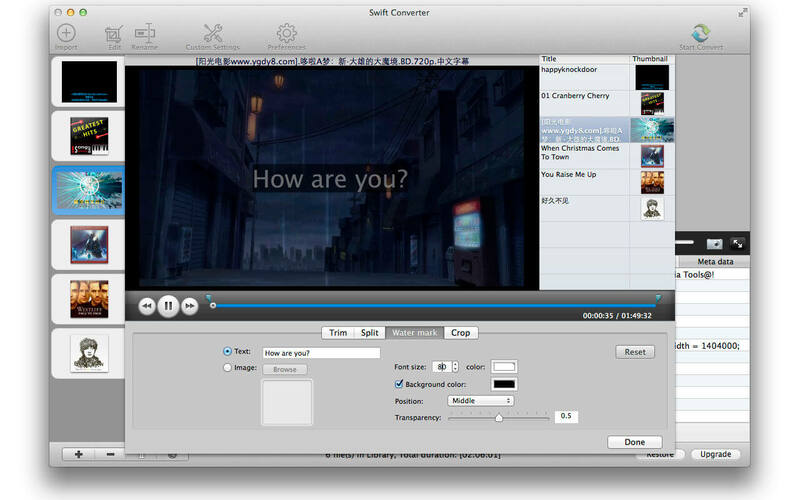 Swift Converter 2 is a video utility tool for converting formats from video to video, video to audio,audio to audio. you can easily edit(split,trim,add watermark,crop) and convert your video or audio with Swift Converter. Convert any formats to your apple device. Also Swift Converter can help you easily extract and convert the audio content from video formats. WMV, RM, RMVB, MPG, AVI, MKV, MOV, FLV, MP4, TS, MTS, 3GP, ASF and more. MP3, WAV, M4A, APE, OGG, FLAC and more. iBooks Author video fully supported. Various import formats and output formats supported. Convert any formats to your apple device. Intuitive and easy settings of output formats. video to video,video to audio,audio to audio. easily extract and convert the audio content from video formats. A player included to previewing your video or audio before convert process, also you can use it as a useful player , create snapshots and so on. Multi Thread of converting tasks. Batch process converting. sync to iTunes when converting finished. Fix bug that may case watermark exception.